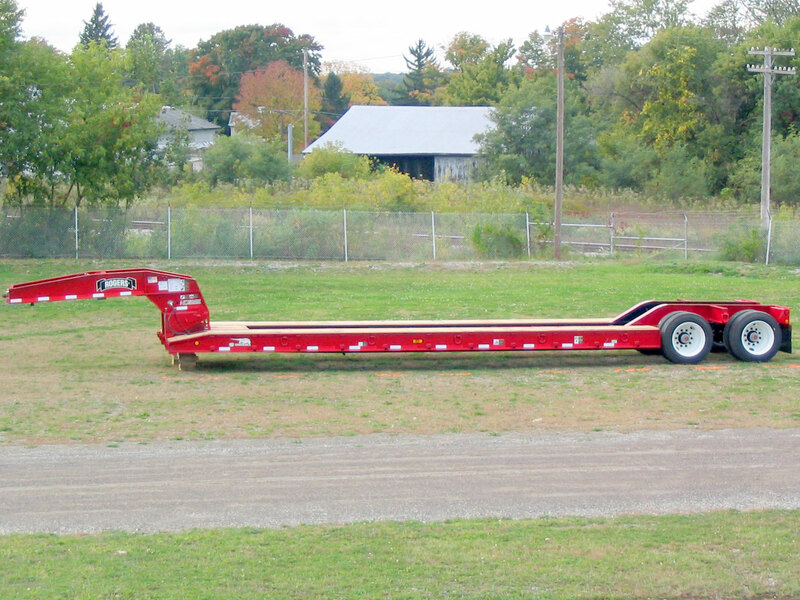 CY35 is the Century Series 35-ton capacity trailer with the "No Foot"® Direct-Push style detachable gooseneck. This durable lowbed's capacity is based on the concentrated load in 2/3rd of the deck. "No Foot"® detachable gooseneck uses lower operating pressures and can lift the rated load anywhere on the deck. The CY35 is built with 10-inch cross beams. The "boom trough" is the opening in the rear frame to assist hauling an excavator to reduce the overhead clearance height. This view of the rear frame shows the oak decking to the tires, and the narrow outriggers bewteen the steel disc wheels.